Tom knows all about stepmothers from the books he's read. They do all sorts of horrible things. 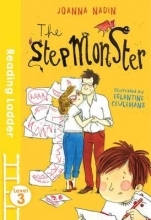 'so when his dad's new friend Lulu comes to tea, Tom is convinced she will turn out to be a stepmonster. 'she might not look like a stepmonster.